Alaska is a great place to celebrate Independence day, and historically, the weather is decent, more often then not. This histogram shows the percentage of time each station received the listed amount of precipitation on July 4th over their period of weather records, 68 years minimum. 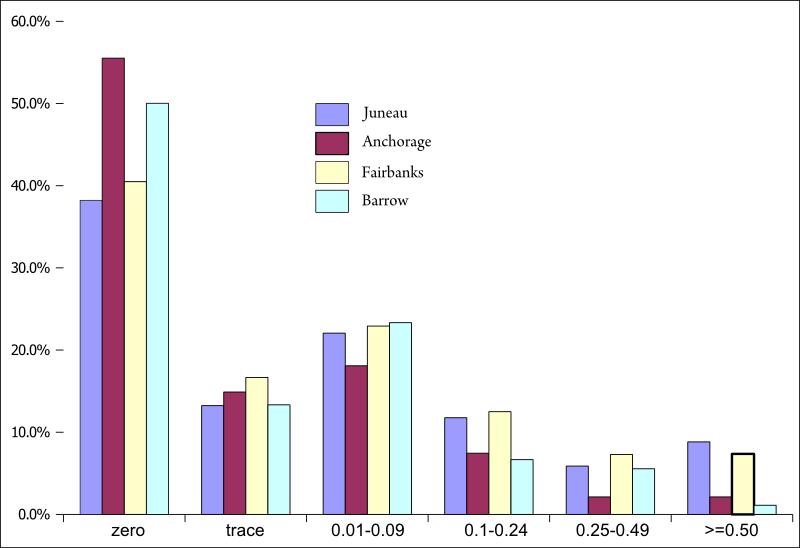 Of these 4 metro (“Alaskan metro”) centers it is surprisingly Anchorage that comes out driest. 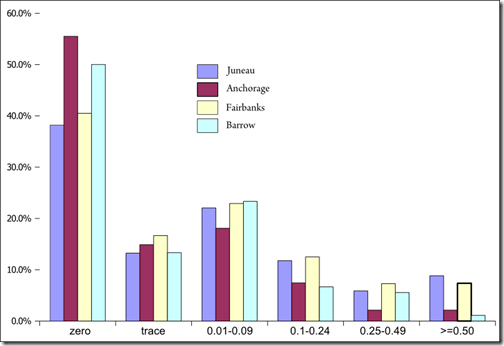 Another surprise is that Juneau and Fairbanks are right about the same! I’d guess that Fairbanks’ rain is more showery and therefore more brief, allowing more sunshine than Juneau’s marine cloud layers. Barrow has more dry days than Fairbanks as well, but fewer days with more than a tenth of an inch…the kind of rain that can really soak a picnic. 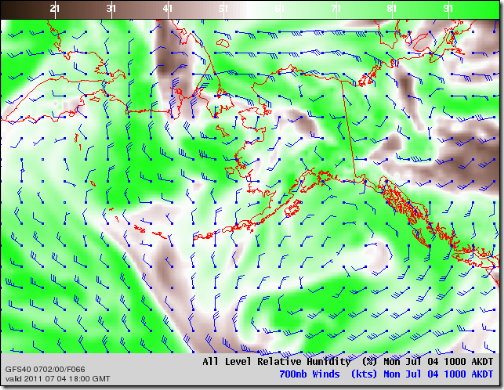 The following computer forecast is for 10 am on the 4th and shows wind barbs at the 700 mb level (~3,000 m/~10,000 ft) and relative humidity through all levels. There are three lows threatening to rain on our parades. One near Kaktovik in the northeast corner of the state, one over the Seward Peninsula between Kotzebue and Nome, and one offshore of Southeast Alaska. Each is feeding moisture via some strong onshore winds. 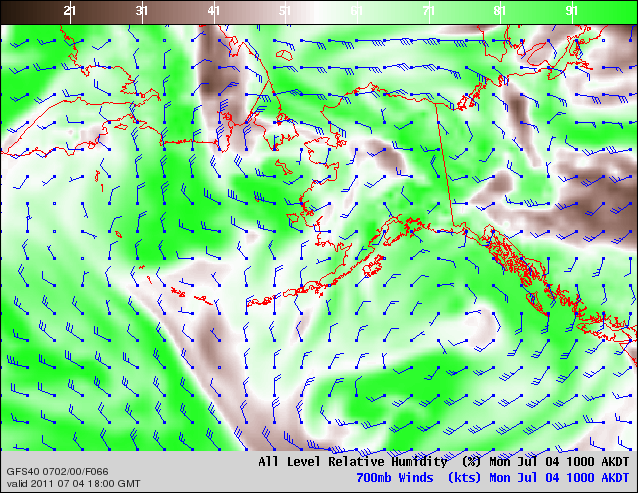 The Seward Peninsula low will hit a little later, hopefully after the celebrations. If its not raining it will certainly be cloudy in for the Panhandle, especially the southern parts. Similar for the north slope although leaning more towards low clouds, drizzle and fog. It does not look quite so bad for the the interior and Southcentral…clouds and perhaps some light rain or showers. Click here for a more detailed, up to date NWS forecast. Then let me know how your 4th was, weatherwise and otherwise.